Conor McGregor faces up to 15 years in prison in the US after allegedly smashing a fan's phone in Miami. Police charged the MMA fighter with "strong-arm robbery and criminal mischief" after the alleged incident outside the Fontainebleau Hotel on Monday night. According to the police report, the incident occurred while McGregor and the complainant were exiting the hotel and the fan tried to take a photo with him. Strong-armed robbery, a theft involving violence, is a second-degree felony in the state of Miami. Conviction of the charge can lead to a heavy fine and a prison sentence not exceeding 15 years. The sentence depends on criminal history, especially history of violence, the value of what was stolen and whether the victim was injured. McGregor's lawyer said the Dublin man was giving his full co-operation in the case. "I believe at the end of the day that we will successfully defend this case," Sam Rabin told 'Newstalk Breakfast' yesterday. "I can't tell you what the outcome will be, but I certainly don't see him going to jail over something like this." McGregor thanked his fans on social media for their support. "Patience in this world is a virtue I continue to work on," he wrote. McGregor previously avoided a criminal record after he pleaded guilty to disorderly conduct at a UFC event in New York last year. Several people were hurt when he hurled a trolley at a bus, smashing a window, as it left the Barclays Centre in Brooklyn in April. Fighters Michael Chiesa and Ray Borg were injured by shattered glass and unable to compete. 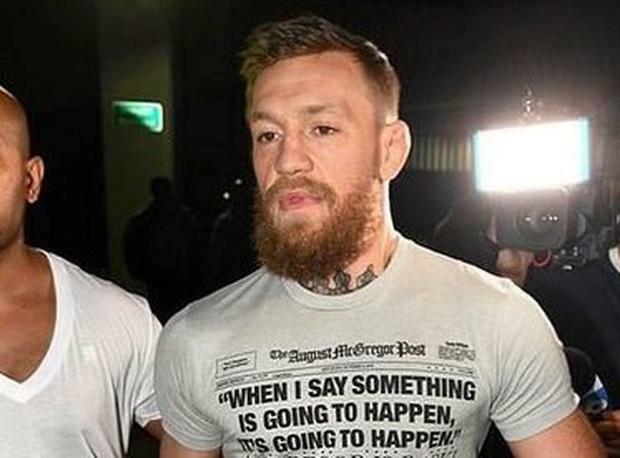 McGregor avoided jail after he agreed to undertake community service. He also had to undertake anger management courses and pledged to keep the peace for a year. The case was before court in July 2018. Independent.ie Newsdesk New York City Mayor Bill de Blasio plans to introduce a bill banning new construction of glass skyscrapers as part of his efforts to reduce citywide greenhouse emissions by 30%. Gillian Flaccus The remains of a World War II US soldier who went missing in the final weeks of the Guadalcanal campaign have been positively identified 76 years after he was listed as missing in action. Eric Tucker US President Donald Trump and his business organisation yesterday sued the Democratic chairman of the House Oversight Committee to block a subpoena seeking years of his financial records.